NEW ORLEANS – The top teams on both the men’s and women’s side remained the same for the second consecutive week in the latest edition of the NJCAA National Indoor Track & Field Rating Index released by the U.S. Track & Field and Cross Country Coaches Association (USTFCCCA) on Wednesday. The men’s squad from Cloud County (Kan.) and the women’s unit from Barton (Kan.) CC once again held in their positions atop the county in their respective rankings. 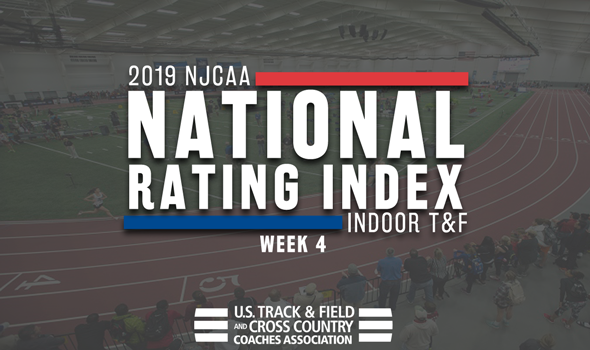 Keep checking into the weekly ratings as more changes should come as the 2019 NJCAA Division I Indoor Track & Field Championships are just around the corner on March 1-2 in Pittsburg, Kansas. For the third straight week Cloud County (Kan.) CC held in the top spot in the country this time with 350.86 points. The T-Birds are fresh off competition at the Northwest Invite this past weekend. The group saw standout performances from Santino Kenyi (fourth in the nation in the 800) and Dennis Kiptoo (sixth in the mile). The program’s 4×400 also posted the fourth-best time in the event so far this season while the 4×800 and DMR squads now lead the country, respectively. It is the first time Cloud County has been the No. 1 team for three consecutive weeks in program history. Advancing up two spots was No. 2 Iowa Central CC with 306.95 points. The Tritons spent the weekend at the SDSU Indoor Classic. Top performances of the meet went to Awet Yohannes (leads the nation in the 1000), Awet Yohannes (second in the mile), Milos Pendic (third in the 3000) and Tyler Lienau (third in the weight throw). The relay groups also had an excellent weekend as the DMR posted the second-best time this year while the 4×400 is now third overall. The 4×800 unit is also fifth overall. Dropping a single spot to No. 3 was Barton (Kan.) CC after it picked up 261.44 points. The Cougars were off from competition this past weekend and will return to the track with the Region VI/KJCCC Indoor Championships on February 15-16. Climbing a spot to No. 4 was Coffeyville (Kan.) CC after it registered 258.11 points. The Red Ravens were led at this past weekend’s Pittsburg State University Gorilla Invite by Dodley Thermitus who is now the national leader in both the long and triple jump. The 4×800 unit also ran the fourth-best time in the event so far this season. Completing the top-five was No. 5 South Plains (Texas) with 247.70 points. The best athlete of the weekend for the Texans was Rylan Olguin who now leads the country in the pole vault after his performance at Arkansas’s Tyson Invitational. Denvaughn Whymns (fifth in the 60H) and Andrew Bosquez (sixth in the 5000) were also top contributors. Rounding out the rest of the top-10 was Western Texas (155.67 points), Monroe (N.Y., 138.28), Colby (Kan.) CC (129.24), Central Arizona (112.55) and Mesa (Ariz.) CC. Barton (Kan.) CC is the No. 1 team in the country for the third straight week, the longest consecutive streak in the top spot in program history. The Cougars, were was off from competition this past weekend recorded 288.24 points in this edition of the ratings. The program returns to action with the Region VI/KJCCC Indoor Championships on February 15-16. Advancing up one spot was No. 2 Monroe (N.Y) with 271.14 points. The Mustangs had athletes at both the Boston University David Hemery Valentine Invitational and the Fastrack National Invite this past weekend. Top performances from the meets came from Faten Laribi (now leads the country in the 1000), Joanna Archer (second in the 600) and Sharon Chumo (fifth in the 5000). Falling one spot was No. 3 New Mexico JC after it picked up 261.14 points. The Thunderbirds were at the Don Kirby Elite Invitational over the weekend and saw top performances from Demisha Roswell (tops in the country in the 60H), Raheema Westfall (third in the 200), Monique Grant (fourth in the 200) and Siyu Gu (fifth in the shot put). Holding steady at No. 4 was Iowa Central CC with 227.98 points. The Tritons are fresh off competition at the SDSU Indoor Classic where they were led by Florance Uwajeneza (fourth overall in the mile) and Lilian Busienei (fifth in the 1000). The program’s DMR team also posted the second-best time in the event so far this season. Also experiencing no change was No. 5 Cloud County (Kan.) CC after it received 203.78 points. The T-Birds competed at the Northwest Invite over the weekend. Standouts included Grace Chinonyelum (leads the nation in the high jump) and Deya Erickson (second overall in the 60H). Central Arizona (196.91 points), South Plains (Texas, 182.68), Cowley (Kan., 137.22), Iowa Western CC (133.66) and Western Texas (113.72) completed the top-10. MEN | WOMEN Mar. 1-2 NJCAA Championships, Pittsburg, Kan.